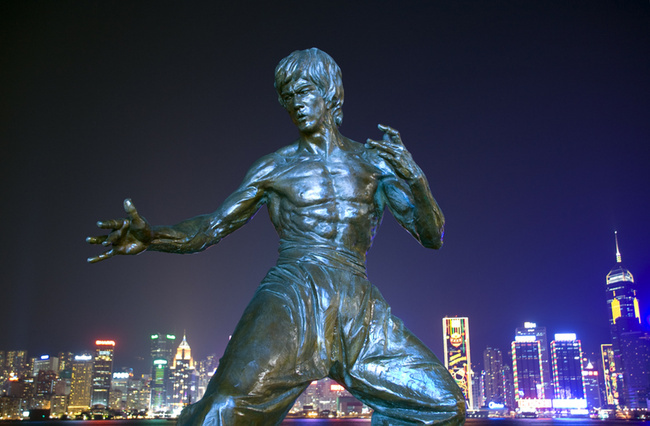 People have been trying to bust into the China market for centuries, and out of every 100 carpetbagging barbarians who show up at the door, maybe 1 walks away with the fortune, the stories, and the scars to prove it all. The UFC is one of the hundred today, looking out across the 1.4 billion strong landscape and wondering, how in the hell am I going to make money off these cats? First and foremost, you have to get to know them. In today’s world that means digital marketing, and especially in China, where phones are probably the quickest and most efficient way to reach the younger crowds. Televisions still rule the landscape—people treat the TV like white noise around here, it’s always on—but outside of that complicated and nepotistic ecosystem, social media is really where it’s at. 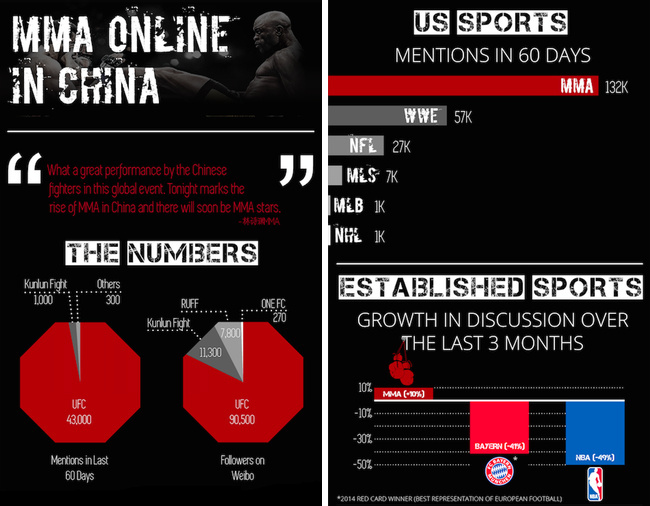 That’s why this infographic, provided by the Mailman Group is an interesting snapshot of the MMA market in China. 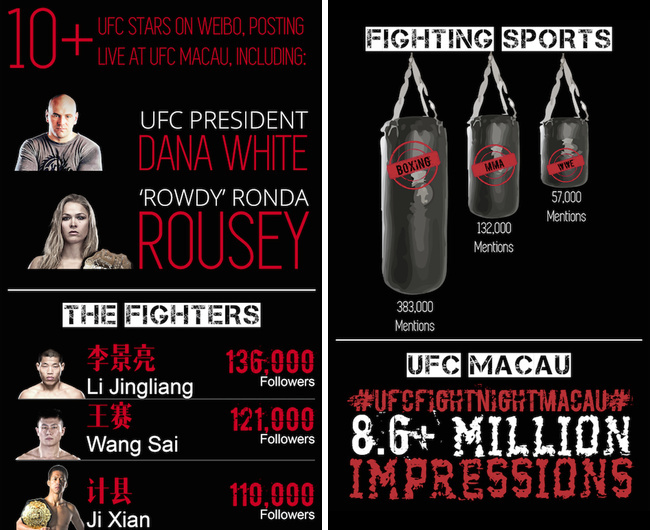 This particular infographic was created during the UFC Macao event on August 23rd, so that has to be taken into account when looking at mentions, and timespan. The first thing that pops up is the absolute dominance the UFC has over local and regional competitors in terms of mentions and followers on Weibo, China’s Facebook/Twitter hybrid, once the most accurate barometer of China’s social media environment. It’s still pretty helpful, but in the last two years, Weibo has been eviscerated by government censorship and eclipsed by other, faster moving social media platforms. The comparisons with other sports and the growth over time stats are cool, but a bit misleading. Very few people in China care about the MLS, MLB, NHL, or the NFL. In fact... outside of the US I think the numbers for all of these sports drop dramatically. And with the Bayern and NBA comparisons, immediacy is at play. The Macao event brought some mentions, and the fact that basketball season hadn’t started affected this. Dana White’s Weibo account is nothing like his Twitter account, but there is an attempt to keep the same tone. For example, when Milana Dudieva defeated Elizabeth Phillips by a very close decision, followed by Yao Zhikui losing another close decision to Royston Wee, the news that Dana was pulling a judge went out on Weibo first. That turned out to be a bad decision on Dana’s part, but the point is, he and the people running his account felt that it was important to give the Chinese fans the impression that the UFC cares deeply about fairness and that they will do whatever it takes to ensure that. One last thing to note about Weibo is the fact that “zombie followers” also helped make drop Weibo from the number one spot in the Chinese social media world. The fighters listed, Li Jingliang, Wang Sai, and Ji Xian are definitely some of the more well known guys in China, and they do have fans. But it’s safe to say that 1/3 of the people listed as followers are actually bots. And, to be perfectly clear, 100,000 people is an apartment block in a medium-sized Chinese city. Which brings us back what the Holy Grail for carpetbaggers and UFC officials: reaching those incredible numbers and getting paid.